The campus of the San Francisco Art Institute in Russian Hill was designed in the 1920s by Bakewell and Brown, architects of the City Hall and the Coit Tower. 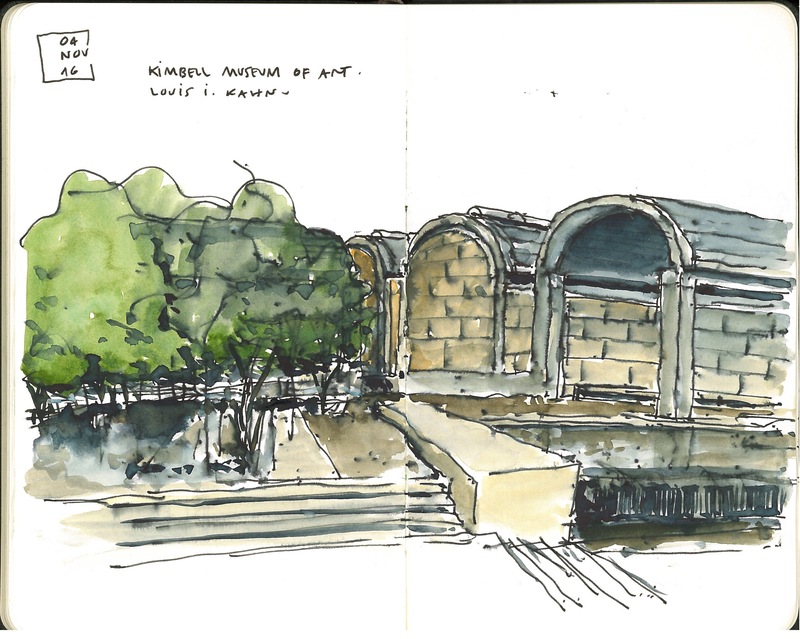 Later in 1969 Paffard Keatinge-Clay, who had worked in Le Corbusier’s atelier in 1948, designed the school’s addition. The program consists of additional art studios, classrooms, faculty and administrative offices, an auditorium; gallery spaces, and a cafeteria, among other programs. Except for the roof terrace (where the auditorium, cafe and gallery spaces are located) the addition sits below the existing complex’s main level due to the abrupt change in topography. The structure resembles the Swiss-French master’s Carpenter Center at Harvard were béton brut, ramps, light canons, and brise soleils are integral elements of the composition. However, in comparison to its East Coast precedent, one could argue that there are far less poetic licenses being present at the Institute. For example, at the Carpenter, the ramp is employed for the sole purpose of producing an architectural promenade. In other words [granting that the ramp at the Carpenter is, in fact, one of the main architectural elements offering unobstructed views of the building’s interior spaces; art galleries and studios] the ramp seems quite a gratuitous way to provide a shortcut through the structure and give access to a secondary entrance and ancillary programs. Nevertheless, the secondary nature of the entrance, almost to justify the need for the ramp, stresses its excessiveness. In contrast, the ramp at the Art Institute not only stitches the interior spaces of the addition with the existing structure but also serves as a bridge that safeguards the abrupt change in topography. Furthermore, at the Carpenter, the roof terrace or fifth façade is enjoyed solely by a private apartment for visiting faculty/artists. 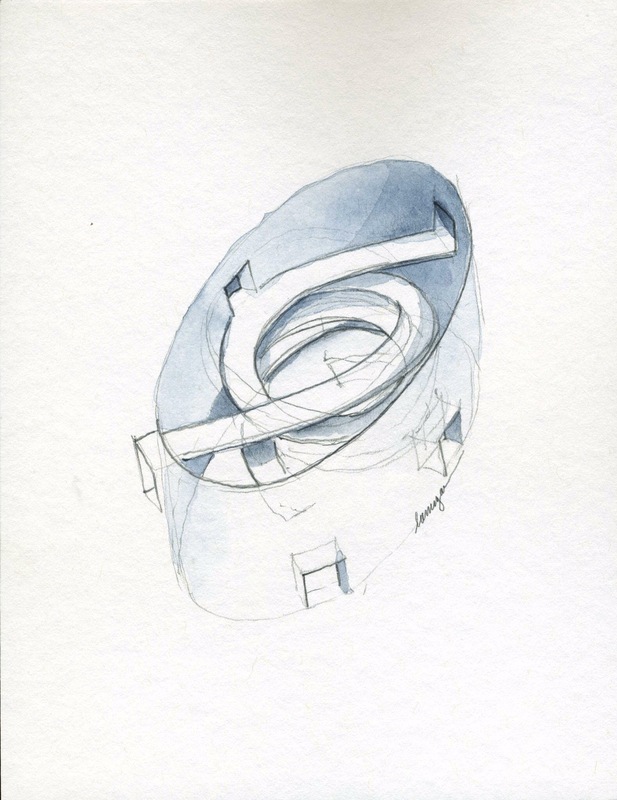 At Keatinge-Clay’s addition, the toit-jardín is –in contrast — the protagonist space. In true emulation of Le Corbusier’s ideas, the roof terrace at the Art Institute becomes a public square, a gathering space where multiple activities take place. 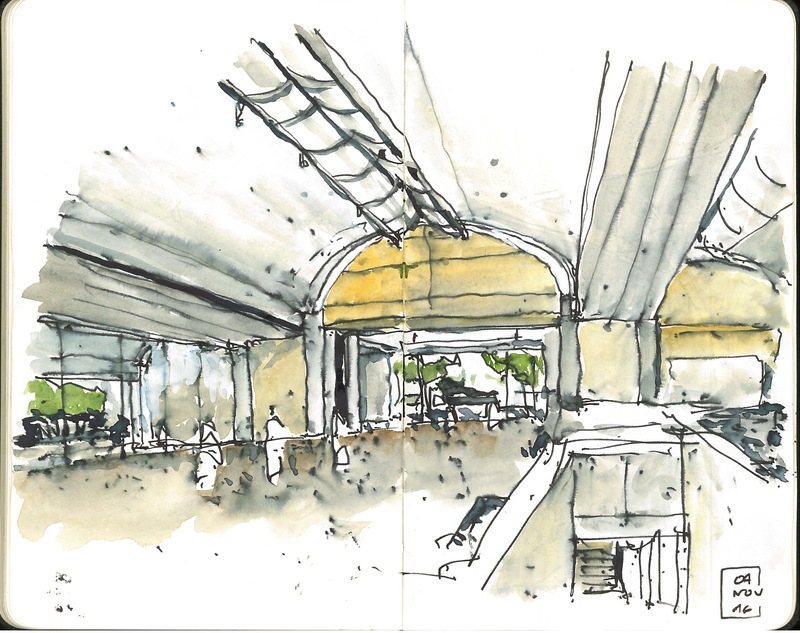 The main space of the terrace (represented on the last sketch and axonometric above) is enclosed on three sides by the main auditorium; an indoor and outdoor gallery space; and the cafeteria. In contrast to the enclosed nature of the existing courtyard, the roof terrace of the additional frame panoramic views of the city as it becomes the hierarchical space of the project. Also, the roofs over the external gallery, cafe, and auditorium become accessible terraces and not only provide additional vantage points of the city but also allow for a diverse array of activities to occur simultaneously. Until last year, while working at Jorge Rigau, FAIA -Arquitectos PSC (jorgerigau.com), I collaborated in the restoration of San José Church in Old San Juan, the second oldest church in the New World. Originally built by the Dominican Order, its construction began in 1532, and spanned until mid-19th Century, with several restoration efforts undertaken during the 20th Century. As an overseer of the conservation effort under the Patronato de Monumentos de San Juan, I recorded minute details of existing conditions, as well as restoration techniques, and on-site solutions and recommendations. 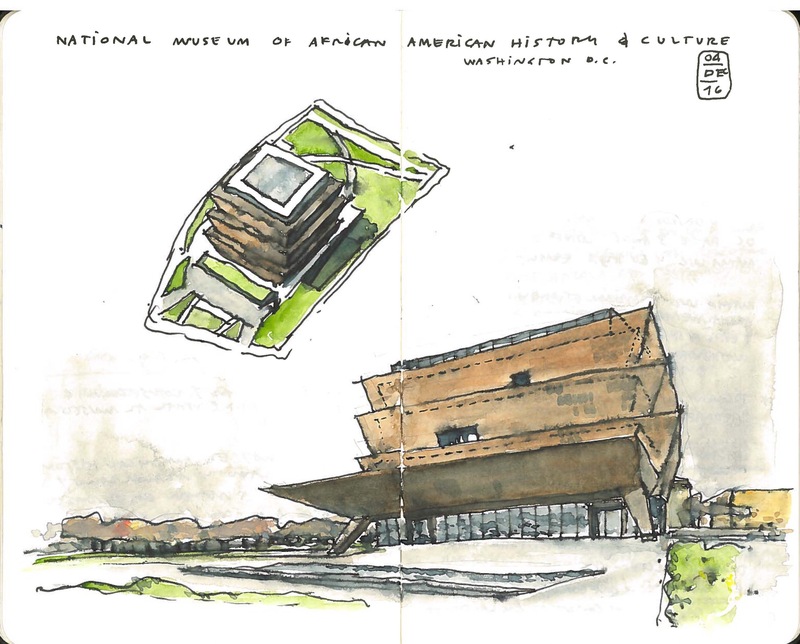 Customarily, architecture projects rely heavily on construction plans; and while historic preservation endeavors are not exempt of including such drawings, on-site sketches and recording field notes tend to have greater weight. First, because surprises abound; second, since — more often than not — complex tasks need to be translated to workers; and finally, because preservation is mainly about restoring traditions, and on-site instructions — I strongly believe — is one of them. In this post and a series following, I’ll illustrate how some of those graphic instructions aided at the restoration of myriad elements throughout San José. While assessing a structural fracture at the Virgen del Rosario Chapel a wall niche or hornacina was discovered behind cement plaster. In what seemed like an attempt to address the structural crack (or change in liturgical aesthetics), the niche had been sealed off from view. Throughout time, a series of earthquakes affecting Old San Juan had structurally compromised the church and several openings had been repaired. Even if well-intentioned, most too often this repairs where performed with incompatible or feeble means and methods. Notwithstanding, vestiges of the original niche were still visible under the improvised enclosures. Therefore, we opted for reconstructing the niche, albeit ensuring an appropriate structural reinforcement of the fractured wall above. 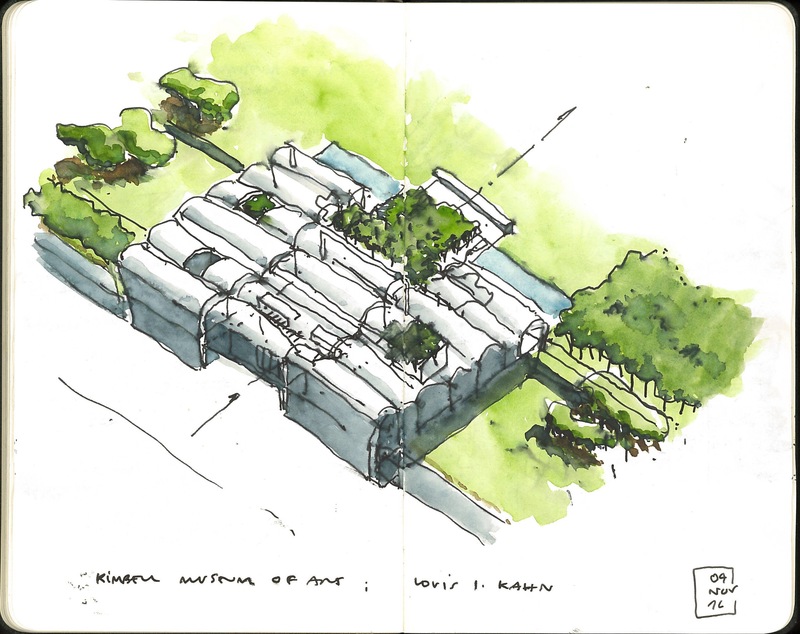 The sketch above illustrates our response; restoring the original half-round niche and providing a half-dome to structurally stabilize the damaged lintel, allowing the safe distribution of gravitational forces towards the reinforced brick masonry base. * We decided just to include our sketches, photos of the process and images of the finished product. But in Puerto Rico, for far too long, traditional means and methods of construction like brick, stone or rubble masonry, had been lost. During the mid-20th Century, disguised as a way to withstand hurricanes, traditional construction including wood had been replaced by reinforced concrete (and eventually steel) construction. Needless to say, throughout the restoration process of San José workers encountered multiple difficulties. Regardless of their avid skills, many initially lacked the discipline to deal with the minute details pertaining traditional construction; careful selection of materials; consistency of mortar mix production; and most importantly, the need for erecting work ensuring geometrical precision in order to withstand the effects of gravity. Workers quickly learned the fact that masonry construction is not as forgiving (not to say malleable) as reinforced concrete; therefore there were many failed-starts. Fortunately, in all instances, workers’ pride for their craft and perseverance worked in our favor. The finished product not only ended as imagined, but it also performs as intended. Built about 1860 and designed by French immigrant architect Juan Bertoli Calderoni, Casa Vives in Ponce, Puerto Rico is an outstanding example of a 19th-century Puerto Rican urban residence with commercial spaces on the ground floor and residential spaces above. Designed in 1967 by architect Louis I. Kahn and finished in 1972 in collaboration with landscape architects Harriet Pattison and George Patton; and structural engineer August Komendant. The museum can be accessed through either the lawn and the beautiful mass of yaupon hollies trees out in the entrance courtyard or the rear parking lot (to the East) one story below the main floor. Either way you enter, the spatial sequence of the building is magnificently clearly laid out. The museum is comprised of 16 parallel halls covered by 20 feet wide by 100 feet long post-tensioned reinforced concrete shells (or vaults). Each thin vault is supported by four reinforced concrete columns which can be visible throughout the building. Entrance courtyard with yaupon hollies and opened porches that overlook the water pools. Main vestibule looking towards the northern courtyard and main stairs connecting to the Eastern vestibule. The interior curving shells have light slots that allows for natural light to enter the galleries. Stainless steel reflectors bounce the natural light difuminating it throughout the curving vaults illuminating the gallery interiors with a soft well-distributed natural light.